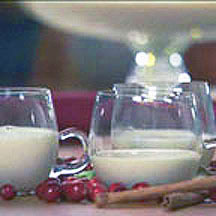 A rich and delicious treat served at any party, this festive beverage dates back to colonial America. In a large saucepan, beat together eggs, sugar and salt. Stir in just two cups of milk. Cook over low heat, stirring constantly. Make sure to get in the corners of the pan or the eggs might curdle when they get hot. When the mixture reaches 160°F (70°C) or is thick enough to coat a spoon with a thin film, remove from the heat. Mix together the bourbon and dark rum but the alcohol is optional. Next stir in the remaining 2 cups milk and a vanilla. Recipe provided courtesy of HolidayKitchen.tv. Photograph property of CooksRecipes.com.